So May has come to an end... a topsy-turvey month, in which the weather veered from February to June (briefly), then back to February, with a final, most welcome attempt at summer on the 31st! As the magnolia faded, blossoms and spring flowers burst forth, and our garden now looks pretty much as it should do at this time of year. It was a month when feast followed feast: Ascension, Pentecost, Trinity... with our own Sophie as always on the 25th; last year just before Pentecost, this year the Trinity - but always a celebration of God's love and generous gift of self to us. We needed that, in a month when hatred often dominated the headlines, especially in the horrific murder of Lee Rigby in Woolwich. All this is in my May wordle, where, at least here, love is so much larger and stronger than hatred. As always there are some fun or thought-provoking juxtapositions. My current favourite is the fact that next door to hatred are the words "just pray", which is often all we can do, and so necessary. And now it's June, the month of the Sacred Heart. I wonder what else the next thirty days will bring...? 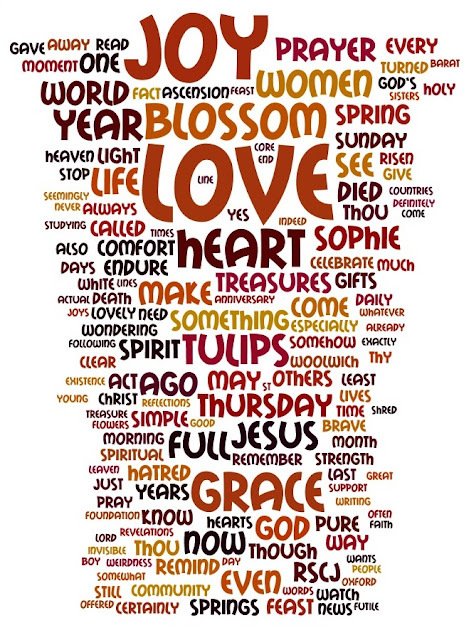 I love looking at your wordle and seeing so many of my favorite words appear in large print. I am looking forward to June, too.